For each oral or poster presentation there must be at least one registered author. All presenting authors (oral or poster presentation) are kindly requested to deposit the registration fee by April 1, 2016. 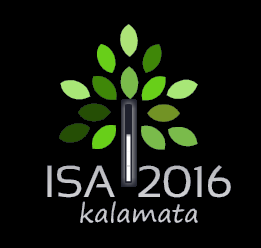 -Download and fill in the registration form ISA2016 Registration Form. -Transfer the registration fee to the following bank address, stating “ISA2016 Registration for <Surname>”. 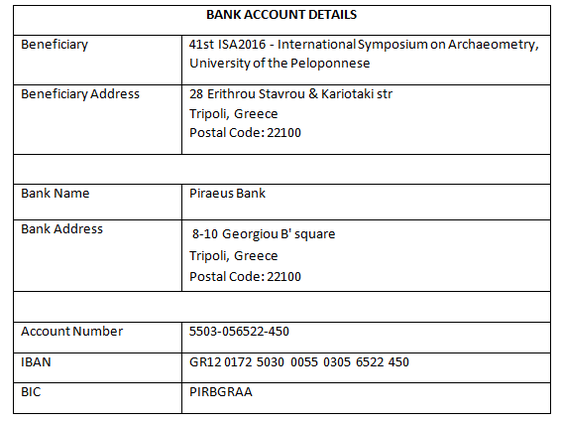 -Send the filled-in registration form and the bank receipt to isa2016@uop.gr, under the title: SURNAME_REGISTRATION. Confirmation of registration will be sent as soon as the payment has been verified. Student registration is available for undergraduate, graduate and Ph.D. students. Students will be requested to provide with proof of their student status at the registration desk.